You might not have heard of Nixeus, they certainly aren’t a well known brand here in the UK, but they do have some interesting credentials. This American company actually partnered up with AMD to produce the first ever FreeSync monitor. It seems they have close ties with AMD and therefore should no how to produce a decent gaming monitor. The Nixeus Vue 24″ was the first AMD FreeSync Certified Gaming Monitor with an Adaptive-Sync Range of 30Hz to 144Hz. 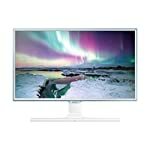 It is a 1080p high definition screen that boasts a 1ms response rate. The monitor has a fairly robust design in my opinion. It’s not what I would call an elegant look by any stretch. This might not put me off but hipsters looking for something that will fit in with an Apple type vibe aren’t going to be sold on this design. But that’s OK, we’re looking at a gaming monitor here! With it’s thick bezel and blocky stand, the NX-VUE24 won’t win any beauty contests but it does have a number of things going for it. The stand is fully adjustable allowing for height, pivot tilt and the classic 90 degree portrait rotation, it’s solid and stable but users have reported the tilt adjustment can be stiff, and the height awkward – but it’s not something you should need to change often. It is easy to assemble though. If you don’t wish to use the included stand it is 100% compatible with VESA 100m x 100mm mounts. It has all the sockets you should ever need, DisplayPort, Dual Link-DVI, HDMI, and VGA video inputs are all included. This model includes both speakers and a headphone jack. Nixeus were early partners with AMD on ‘Project FreeSync’ so they know a thing or two about the adaptive sync technology. And in fact this model boasts one of the widest FreeSync windows operating over 30Hz up to 144Hz. What does that even mean? Well, some FreeSync monitors drop out of adaptive sync mode if the frame rate dips lower than 40 frames per second, which is often just what your frame rate drops to than particularly busy moment in the game. But in this case the Nixeus will continue to stay synchronised to your graphics card right down to 30 frames per second, and all the way up to 144! The TN panel is capable of providing a super fast 1ms refresh rate and can deliver 144 framers per second to ensure super smooth gaming assuming your graphics card can keep up! There is sometimes controversy over whether fast frame rates make a real difference but personally I would always go for a monitor that could deliver more than the standard 60Hz. 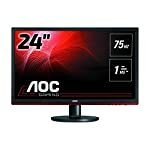 I think the benefit diminishes as you go higher and higher so a 144Hz display is going to be great for gaming. Professional reviewers report back uniform colours and low glare but do remember TN panels can suffer from limited viewing angles with colour accuracy dropping away when you look at it from obscure angles. Which is OK if you plan to be sitting directly in front of it when gaming. You can improve upon the out of the box performance with some calibration, you can find guides on this hosted in the technical reviews. This is a no frills monitor with strong gamer credentials. It brings 144hz Adaptive Sync gaming into the reach of cost conscious PC owners. We give the Nixeus NX-VUE24 a 4 out of 5 rating. Want to know what existing owners of the monitor think? You can read real user reviews here. Should I buy the Nixeus NX-VUE24? The Nixeus Vue 24" offers one of the widest FreeSync ranges on the market so this is an interesting monitor for any AMD Radeon owners looking for a high performance 1080p monitor. The 144Hz refresh rate combined with a 1ms response time is going to give a great gaming experience. Some might be put off with a TN panel but that does help to keep the cost down. If you are having some doubts about this purchase then why not read some real owner reviews and see what other buyers think. Welcome to the Nixeus NX-VUE24 FAQ. This section attempts to answer common questions you may have, please get in touch if you have any more queries or if you think our answers need updating. Nixeus are a US company based in California. 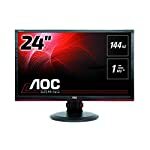 They specialise in computer monitors, peripherals and consumer electronics. They’ve been at it since 2009. You can find out more about them on their website. Does it include a DisplayPort cable? Yes, there is a handy DisplayPort cable included in the box. Although do note that packages can vary from region to region so if you really want to be sure, contact your supplier. This is aimed at the PC gamer market, you won’t be able to get 144Hz or use FreeSync. 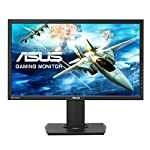 You are best off looking for something cheaper if you are just after a console monitor.